But lost in that disappointing decade of averages is a decade of fairly steady and unexpectedly universal progress for one set of students: high achievers. Not every top scorer benefited to the same degree—and that’s an enduring and substantial problem—but benefit they all did. NAEP is administered every two years, and scores can fall into three “achievement levels” dubbed Basic, Proficient, and Advanced. The grade- and subject-specific cutoffs are meant to reflect real-life aptitudes. Proficient is defined as “solid academic performance for each grade assessed.” Advanced indicates “superior performance,” and is therefore NAEP’s best proxy for “high-achieving” or “gifted” students. 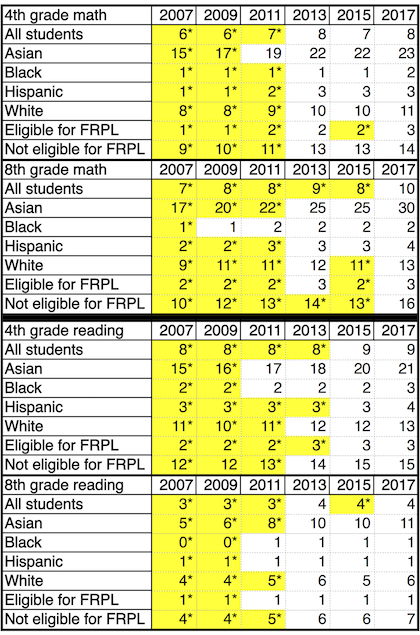 Table 1 shows how students have fared in fourth and eighth grade over the last decade in reaching the Advanced level in math and reading. It includes results for all pupils, as well as results broken down by race and eligibility for free or reduced price lunch, which is the standard way of relating income to school achievement. An asterisk and yellow background denote a significantly different (p < .05) score from 2017. There are two big takeaways—one great, one worrisome. First, as the data plainly show, more students reached NAEP’s Advanced level in 2017 than in 2007 in both grades, both subjects, and every subgroup. And in every instance, the difference across that decade is statistically significant—sometimes massively so. In eighth grade math, for example, almost one third of Asian students reached the test’s top level in 2017, a 13-percentage-point increase over ten years. This is all rather remarkable. And every parent, teacher, and advocate who helped make this universal progress possible deserves a round of applause. But once the plaudits subside, much work remains to address the data’s other takeaway: huge and widening gaps among subgroups of high achievers, discrepancies that Johns Hopkins professor Jonathan Plucker rightly calls “excellence gaps.” Yes, black, Hispanic, and low-income students have seen gains, but from a depressingly low base, especially compared to white, Asian, and affluent peers. The 2017 percentage-point difference between white and black students who reach NAEP Advanced, for instance, ranges from 5 points in eighth grade reading to 11 points in eighth grade math. For Asian and black pupils in 2017, it’s between 10 and 28 percentage points. All of these are wider gaps than in 2007. And the refrain is the same for low- and high-income students, between which the Advanced-level gap has also widened in both subjects and grades in the last decade. The next question is, of course, why. Why have all of these socioeconomic subgroups seen gains at the high-end? And why are the more advantaged groups rising faster? NAEP does not and cannot give us answers. And the first query is a particular mystery. Perhaps it was some combination of better standards, higher quality and more adaptive assessments, stronger accountability, broader choice, and more. No one can be sure. For the second question—why excellence gaps have worsened—one reason likely has to do with schools’ uneven offerings for high achievers. Indeed, Fordham’s January report, Is There a Gifted Gap?, examined income- and race-based differences in gifted programming and found that students in low-poverty schools are more than twice as likely to participate in gifted programs than their peers at high-poverty schools. And even when black and Hispanic K–8 students attend schools that offer such programs, they participate at much lower rates than white and Asian children. Such differences might lead to a rising tide that lifts all boats, but favors vessels carrying advantaged students. In Massachusetts, for example, America’s highest-achieving state, white, black, and Hispanic eighth graders reach NAEP Advanced at twice the national rate. But this again masks massive academic inequalities. Although one in every five white students is advanced, that’s true of just one in every twenty-five black and Hispanic students—a gap that is also twice what it is nationally. Meanwhile, a gifted program exists in just one out of every twenty Massachusetts elementary and middle schools, a lower rate than everywhere except Rhode Island and Vermont. And less than half of one percent of the state’s black and Hispanic students participate in such a program. States, districts, and schools might therefore consider identifying more high achieving students and offering them more opportunities that maximize their education. Doing so could—done well, it should—get more disadvantaged students to NAEP’s top level and help narrow the excellence gap. For now, however, let’s at least recognize and applaud a remarkable decade of universal progress among America’s high achievers. Be it fourth or eighth grade, math or reading, Asian, black, Hispanic, white, low-income, or high-income students, all reached NAEP Advanced at a greater rate in 2017 than in 2007. Yes, the growth is problematically uneven, and there’s much work to be done to remedy that. No, we’re still not internationally competitive at the high end. But for once we’re at least seeing something that qualifies as good news.